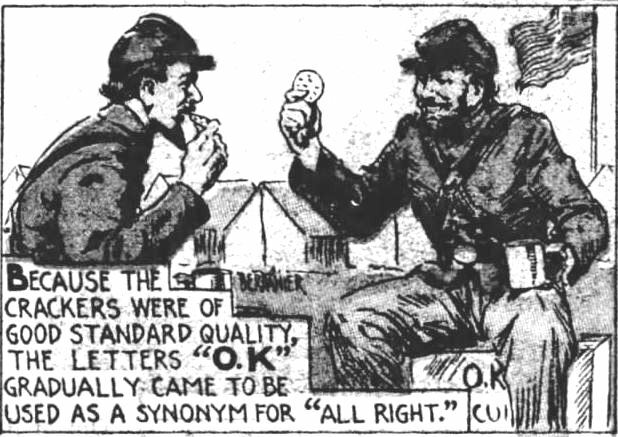 Readers of historical fiction are often unaware of word origins or the era in which new words found their way into common use in the English language. I’ve noted book reviews by well-meaning readers who criticize authors for using “okay” or “O.K.” prematurely, hence inaccurately. 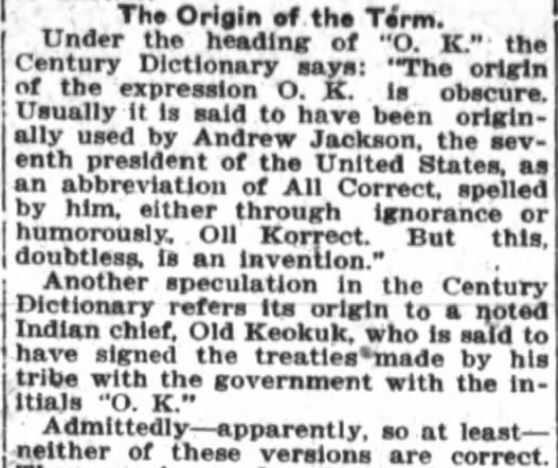 I’ve chuckled at readers who state, emphatically, that 1890 was way too early to use “O.K.”–because they’re incorrect and the author used the term (O.K.) with historical accuracy. 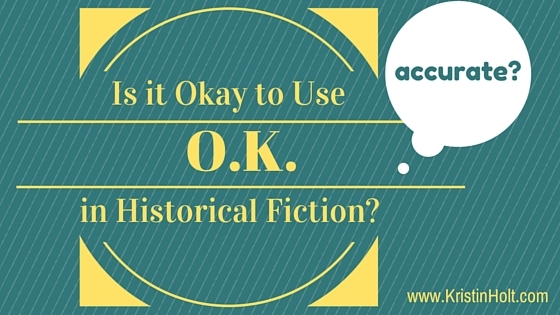 “Okay”, on the other hand, is definitely not okay for 19th century settings. O.K. is documented to have existed in the United States, in print, from at least 1839, and widely used in print from the mid 1800’s. Okay, however, is much newer. 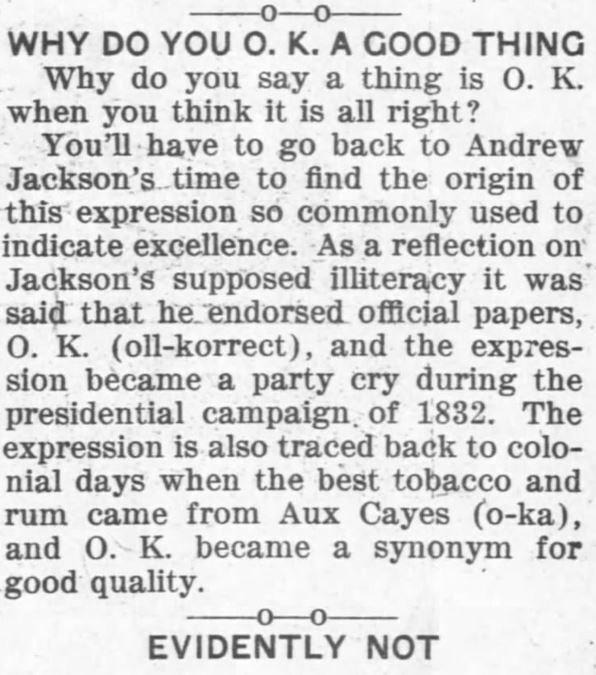 The use of “okay” showed up in the mid twentieth century. 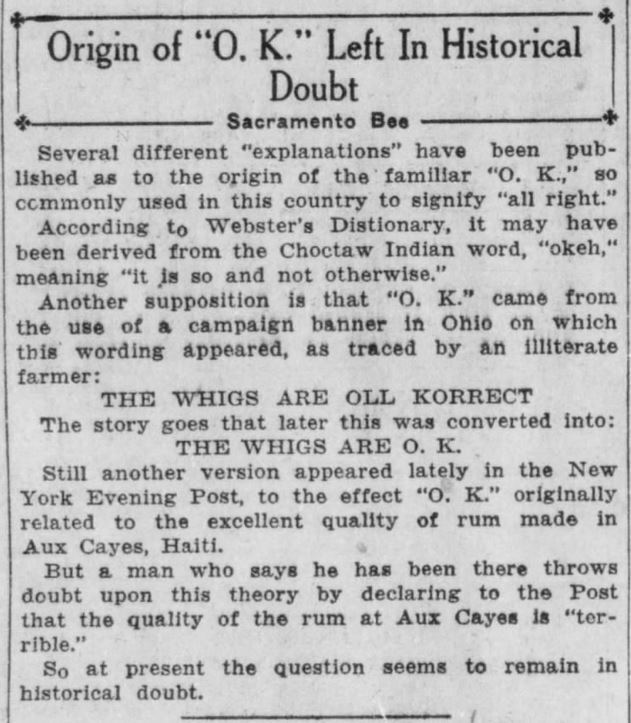 In 2018, I stumbled across a compelling etymology statement that argued convincingly for Wolof, a West African language influencing American English during the black slavery history (18th and early 19th centuries). Read all about it. 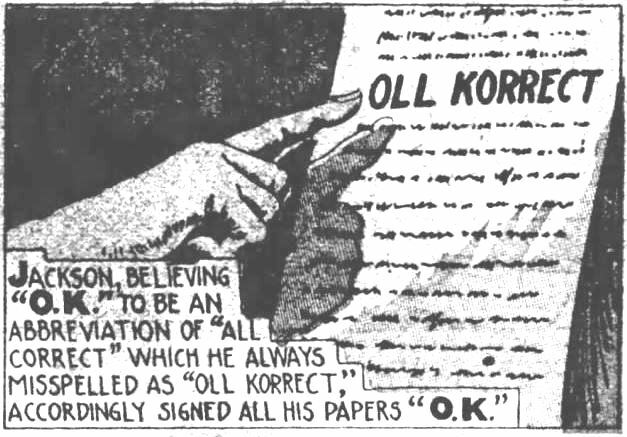 Using my subscription to newspapers.com, I searched for the oldest recorded use for “Oll Korrect” (in the subset of current newspapers available to me, as of May 11, 2016). 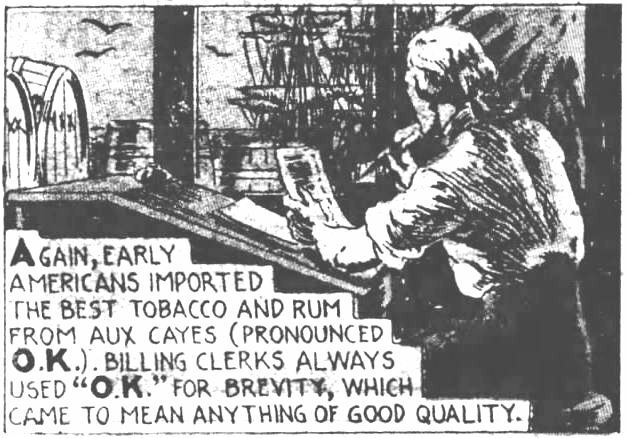 In this ever-changing subset of printed archives, the oldest/earliest documentation I could find was in The Brooklyn Daily Eagle. 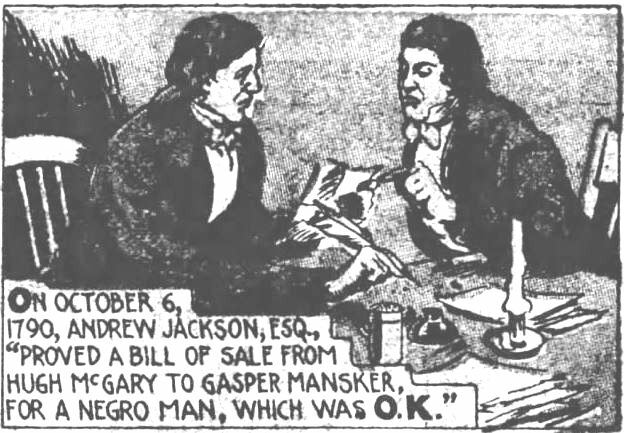 The Brooklyn Daily Eagle, Brooklyn, New York, on 24 October, 1842. Oll Korrect? Isn’t that a wretched misspelling? 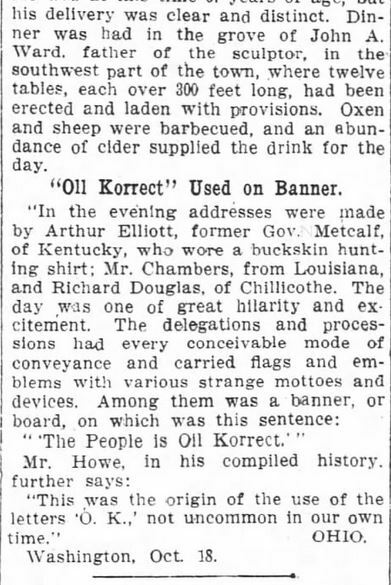 Century Dictionary, quoted in The Fort Wayne Journal-Gazette of Fort Wayne, Indiana, on 3 October, 1915. 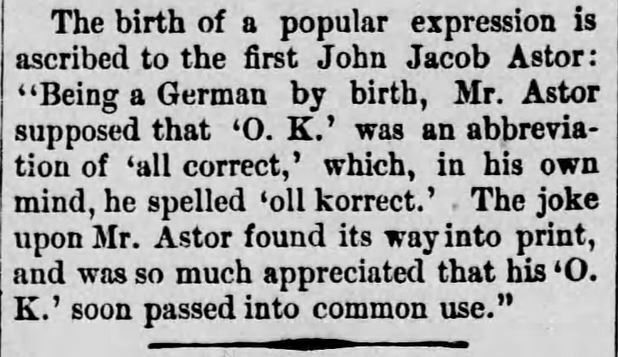 The Daily Republican, of Monongahela, Pennsylvania, on 24 April, 1890. O.K. Presidential Campaign of 1832. 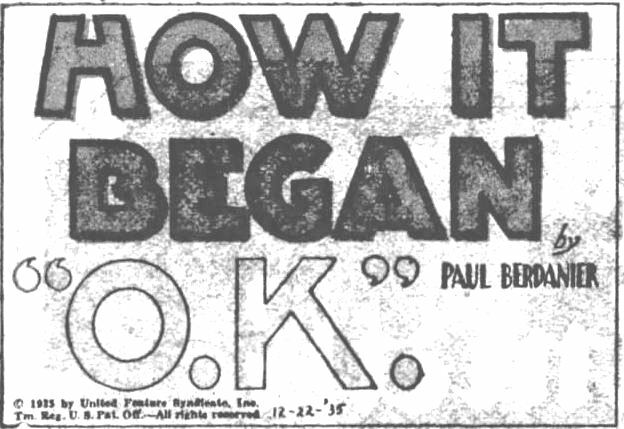 The Day Book of Chicago, Illinois, on 7 April, 1914. 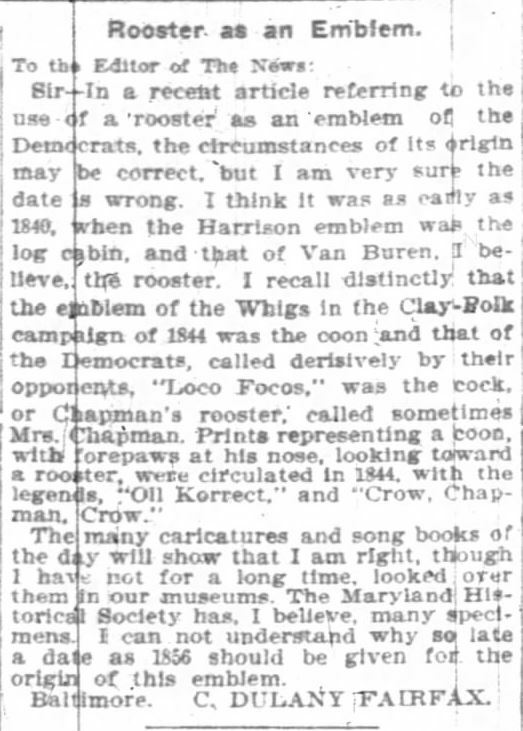 Oll Korrect: rooster as an emblem. 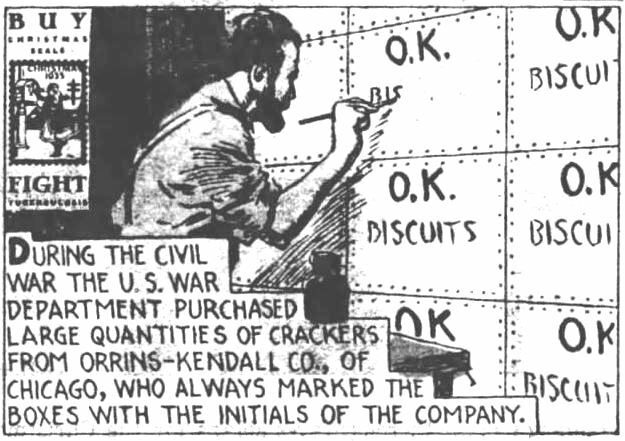 The Indianapolis News, Indianapolis, Indiana, on 19 January, 1903. First Use O.K. : Harrison’s Campaign 1840. Part 1. The Washington Post. Washington, DC. 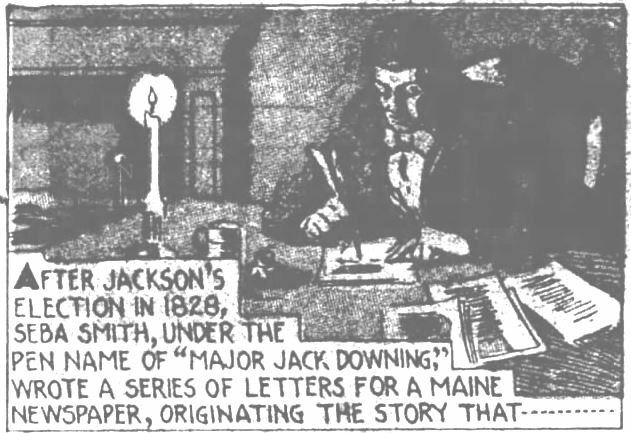 21 October, 1909. First Use O.K. : Harrison’s Campaign 1840. Part 2. The Washington Post. Washington, DC. 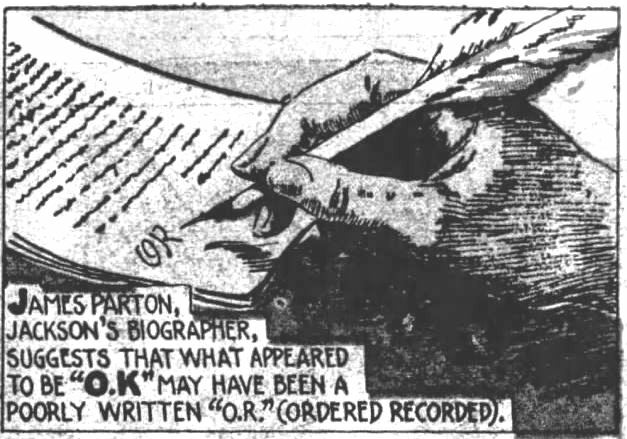 21 October, 1909. First Use O.K. : Harrison’s Campaign 1840. Part 3. The Washington Post. Washington, DC. 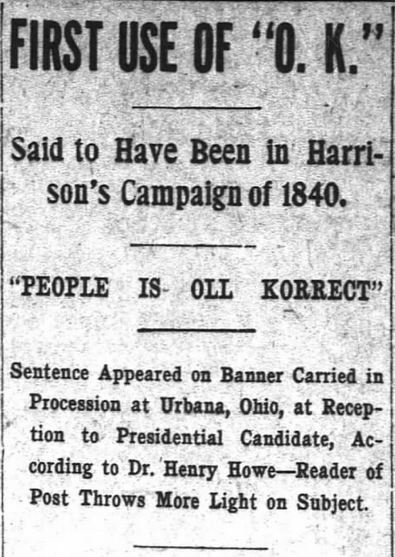 21 October, 1909. 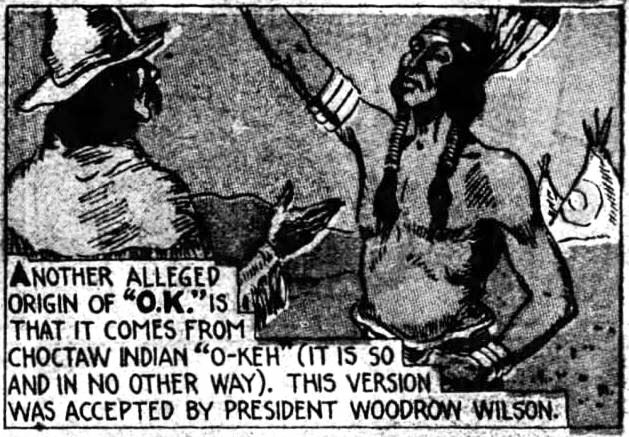 Origin of O.K. in Historical Doubt. Santa Ana Register. Santa Ana, California, on 29 November, 1927. St. Tammany Farmer. 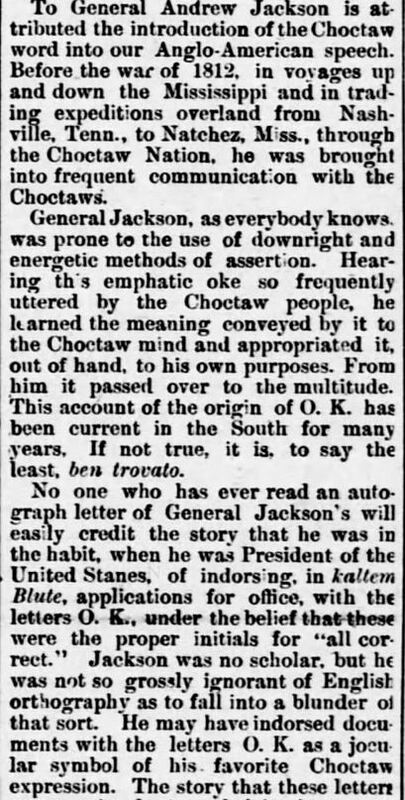 Covington, Louisiana, 10 October, 1885. St. Tammany Farmer. Covington, Louisiana, 10 October,1885. How it Began. part 1. The Evening News. Harrisburg, Pennsylvania on 21 December, 1935. How it Began. part 2. The Evening News. Harrisburg, Pennsylvania on 21 December, 1935. How it Began. part 3. The Evening News. Harrisburg, Pennsylvania on 21 December, 1935. How it Began. part 4. The Evening News. Harrisburg, Pennsylvania on 21 December, 1935. How it Began. part 5. The Evening News. Harrisburg, Pennsylvania on 21 December, 1935. How it Began. part 6. The Evening News. Harrisburg, Pennsylvania on 21 December, 1935. How it Began. part 7. The Evening News. Harrisburg, Pennsylvania on 21 December, 1935. How it Began. part 8. The Evening News. Harrisburg, Pennsylvania on 21 December, 1935. How it Began. part 9. The Evening News. Harrisburg, Pennsylvania on 21 December, 1935. 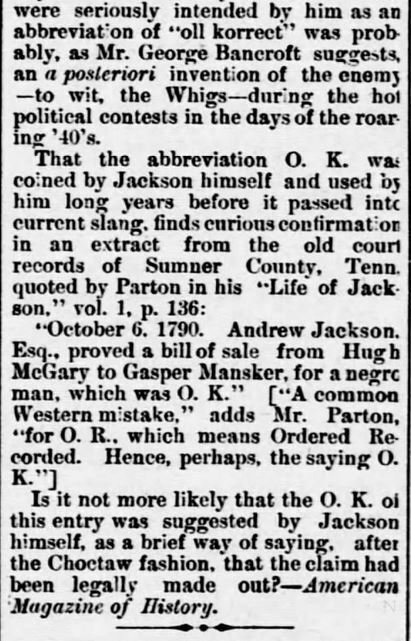 Fiction set in the 19th century may certainly, with accuracy, use the term “O.K.” as it is currently defined (It’s always had the same meaning). 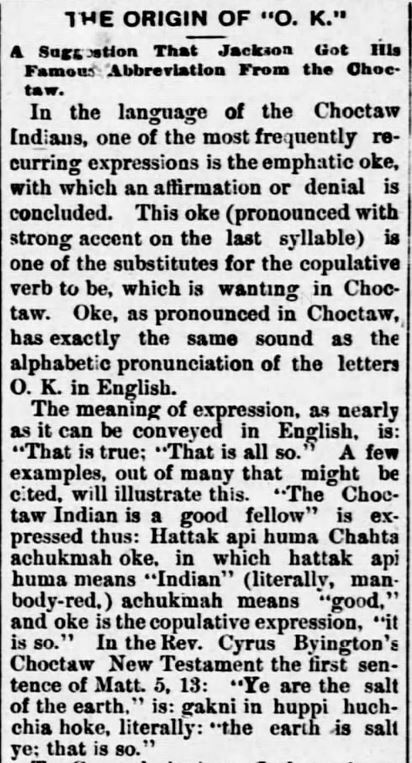 The only time the use of “O.K.” is inaccurate, in the 19th and early 20th centuries, is if spelled in the much more modern way: “okay”. Definition of Love Making was Rated G in 19th Century First Historical Use of term “Correspondence Courtship” First Historical Use of term “Mail-Order Bride” How Much Research Does It Take? Another wonderful article. I learn a lot from your articles which help me in my writing. Accuracy is important and you bring all of us more knowledge on interesting subjects. Thank you. I appreciate your feedback and your kind words. Many thanks for reading and commenting! O.K! You got it covered. Great research, Kristin.